New Flats! Vincas, pentas, lantana and purslane just arrived. 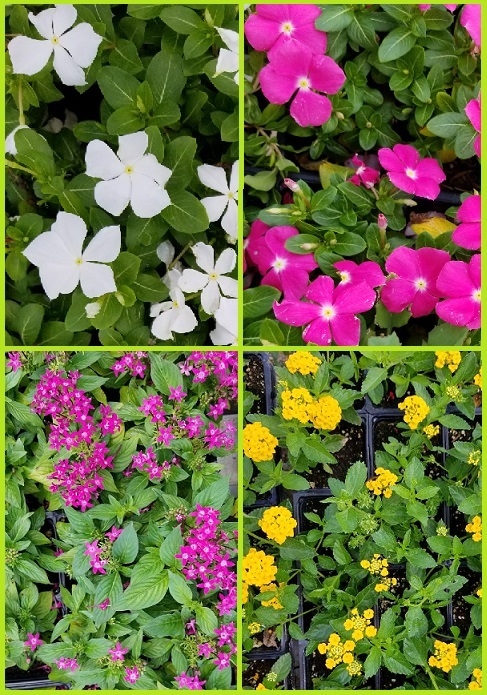 Flats of vincas, pentas and lantana. Hummingbirds and butterflies love lantana! How to care for Vincas: Vincas thrive in full sun and are drought tolerant. Keep the mulch two to three inches away from the vinca’s stems to prevent the development of rot. Water when soil is completely dry, but don’t splash the foliage. Best time to water is in the morning. New Flowers Just Arrived At J&J Nursery!